"The world - much as we want it to - does not accord with our intuition... Those who are successful at creating social epidemics do not just do what they think is right. They deliberately test their intuitions." Malcolm Gladwell is a Canadian journalist, employed as a staff writer at The New Yorker magazine. He has written many books, but The Tipping Point is his most famous. As the quote above explains, The Tipping Point is concerned with the creation of "social epidemics," or the passage of certain thoughts, fashions, or trends from a low level of popularity to an exponentially increasing state of ubiquitousness. Or, to put it another way, how does a book go from being a local phenomenon to a national craze? How does an incident of gun violence become a national crisis? And how does a pair of "cute shoes" become something that every teenager is wearing at the local mall? In the author's thinking, the progression from virtual unknown to cultural necessity is not gradual. Between obscurity and overwhelming success (or society-wide failure), there is a tipping point beyond which a thing becomes part of the fabric of our lives. And how are we to anticipate this tipping point? The author points out three types of people who tend to incite trends: the Maven, the Connector, and the Salesman. The Maven is an expert on a particular subject, someone looked to by others for his or her abundance of information. The Connector is the person who inhabits the most wide-ranging social group, and a person who brings people of varied interests together. The Salesman is, as you might imagine, a person skilled at converting others to their point of view. All three types of people have important roles to play in any social network, and all three types contribute to pushing things toward the tipping point. The author points out other important features of the social landscape. One such feature is the "stickiness factor," or how well an idea is communicated across mediums. Another is the power of context over individual and group decision-making, and the fact that a person's character varies a bit from situation to situation. The author backs up these concepts with a wealth of examples, and I could find no flaws in his arguments. The only problem with this well-researched book is its age. Written in the late 90s, and published in the year 2000, its discussion of societal norms takes place in the absence of Google, in the absence of Facebook, and in the absence of smartphones. Some of the examples he uses are also dated, and in light of recent events could cut both ways. Using New York City's fight against crime, for example, is less convincing in the presence of recent social unrest and pressure to reform law enforcement. This book was, after all, written before 9/11, before Black Lives Matter, and before Donald Trump was President. But this is a small complaint. 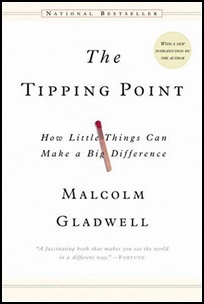 The Tipping Point is still a great book, and I found it very informative.